The overall aim of KAS18 was to mentor and upskill advanced undergraduate and early graduate Nepali students in both professional and academic areas through engagement with 4 a highly-qualified international faculty. KAS18 saw the participation of 25 undergraduate and graduate Nepali (19) and international (6) students, with maximal gender diversity (12 females and 13 males), selected from over 260 applicants. Achieving gender parity was one focus in the selection process, which also took into account students’ academic history and their written responses to application questions regarding their reasons for applying. A small percentage of positions within the program were reserved for international students from nearby countries to increase the standing of KAS18 as an international level program for the region, but was primarily to ensure that local students had valuable interactions with other students from outside their own country. Students were introduced to basic concepts and computational techniques in astrophysics and cosmology via lectures, supervised hands-on research projects with student presentations, seminars on professional development and networking. 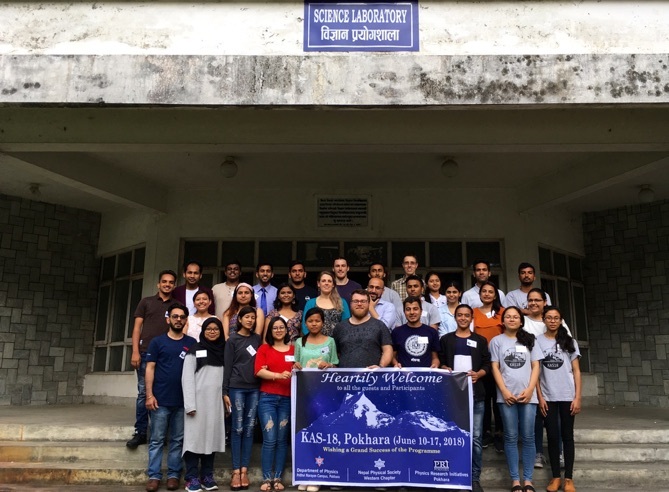 The KAS18 faculty also gave two public talks, one on “Stars, Galaxies, and the Universe”, organised in collaboration with the Pokhara Astronomical Society, and one on “The Furthest Galaxies” as part of the Science Discussion Series of the Pokhara Physics Research Initiative. KAS18 was also characterised by social activities including group dinners and a half-day excursion to explore Pokhara.